With more than four million people in the Phoenix metropolitan area, there seemingly aren’t many places you can go to escape the hustle bustle of city life. But if you head north on I-17 for 24 miles, take exit 223B and turn left, you’ll stumble upon one of the valley’s best kept secrets. Quintero Golf Club is nestled on 828 acres of pristine desert land that offers its members a sense of seclusion and serenity. This Rees Jones design stretches 7,208 yards and rollercoasters golfers among elevations ranging from 1,986 to 2,670 feet. While the club is a private establishment with 130 members from around the world, General Manager and Director of Golf Tom Wilcox says Quintero now welcomes all golfers with open arms. Quintero recently established a “Member for a Day” program allowing Arizona Golf Association members to play the course at a guest rate. For those out-of-towners seeking the exclusive private club experience, Quintero also accepts guest play on available basis. Wilcox says the move to offer guest play at the private establishment is just one of the ways the club is trying to stay current with the evolving role golf plays in men and families’ lives. “The day of the guy coming to the club in the morning, teeing it up with the boys, playing golf all afternoon is gone,” said Wilcox. While Wilcox knows those days are over, he’s not certain what lies ahead for his club or the game. What he does know is that Quintero wants to provide its members and guests with a more modern, enjoyable and lenient atmosphere while still holding steadfast to a commitment to provide elite service and golf. Wilcox says wearing jeans in the dining area is acceptable and that you’re allowed to bring your cell phone on the course but he asks that you please turn it on vibrate. The relaxed mood of the property should be left on the practice range—when you step up to the first tee, you had better have your game face on. There isn’t a bad hole at Quintero. And while you can’t necessarily pinpoint what’s so tough or challenging about the course, you will certainly feel like every part of your game was tested. Quintero is robust in spectacular views, gently rolling greens and deeply taxing bunkers. The par-3s are some of the best in the valley and the fairways are generally wide and bowl-shaped. The par-4 third at Quintero is a true golf hole; one that makes you strategize and hit a solid shot. The hole stretches 406 yards from the back tees, slightly doglegs left and is protected by water along its left side. A desert ravine runs the width of the fairway 120 yards shy of the green, forcing you to hit an iron or hybrid off the tee. A well-placed tee ball will still leave you a lengthy approach to a green guarded on the right by bunkers and the left by desert. A miss here can only be short right; if you’re drawing the ball left at all, you may as well consider it reptile dinner. Two precisely planned and executed shots are your only chance at scoring well on this hole. No. 8 is another hole that requires focus and good shot-making. This 586-yard par-5 is an uphill dogleg right that crosses a ravine and is heavily guarded by bunkers all along the right. Depending on what tee box you play, you may need to seriously consider hitting something other than driver off the tee. Whichever club you choose, pick your target and trust your line, as your line of sight from the tee is partially encroached upon by desert. It is a noticeably awkward feeling, standing over that tee shot, because you can’t see the lay of the hole and you’re not entirely certain how far you have until the fairway runs out. Conquer the tee shot and you’ve only won half the battle. Your second and third shots will be hit directly uphill. Stay left center of the fairway to avoid bunkers right and to place yourself with a good angle into the elevated green. A par here will feel like a lot of work but you will feel so accomplished if you achieve this feat! The 9th hole at Quintero is my favorite—beauty, charm and a little bit of pizzazz all rolled into one. This par-3 extends 212 yards from the tee and is a 90-foot drop to a green protected by a streaming pond short of the green and bunkers long right. If you’re feeling adventuresome, I encourage you to hit from the tips even if that’s not where you’ve been playing from all day. I know watching my 3-wood land safely on the green was one of the most rewarding shots I hit the day I played. Long and left is the bail-out shot, but a missed green here doesn’t necessarily leave you with an easy up-and-down. A par on this hole will be the anomaly of your group. The back nine is equally as enjoyable as the front. No. 14 is a 552-yard par-5 that pinches in the fairway where most tee shots will land. This helps keep balls in the fairway and not in the desert, setting golfers up for a good chance at par. Two more solid shots on this uphill hole will place you nicely on this green guarded by bunkers on either side. No. 16 is another breathtaking par-3. From the tips it plays 201 yards and drops 60 feet in elevation. Bunkers line this hole all along the right, but the green is fairly large and inviting. Be sure to place your ball near the hole or else a long lag putt may leave you in danger of a three putt. Similar to No. 8, the 17th at Quintero is a dogleg right, uphill par-4 guarded heavily by desert all along its right-hand side. An easy fade off the tee will leave you in an ideal position for your approach. Be careful not to go too far right, as bunkers and desert are an immediate danger once the right side of the fairway runs out. Be sure to take enough club to this elevated green, anything short will find itself rolling back down the fairway toward you or worse, in a characteristic Rees Jones bunker—one that requires that late-in-the-round burst of adrenaline to get it out and knock it close. When you walk off 18, it’s not uncommon for you to feel mixed emotions. Defeated yet encouraged, puzzled yet clear-minded, satisfied yet wanting another go-round at it. The course is a pleasant play, yet sneakily hard. If you don’t believe me that this course is tough, just ask anyone who’s ever played a competitive round here. 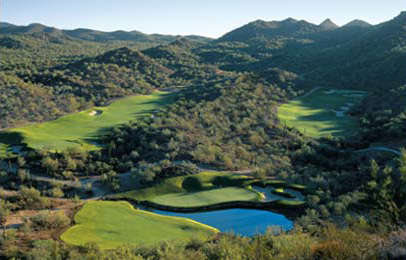 The Women’s State Amateur was held at Quintero in 2004 from 6,000 yards. The winning score? Thirteen over par for three rounds. While Quintero may be challenging, it certainly isn’t lacking in accolades or notoriety. Golfweek Magazine named the private club to its “Top 100 America’s Best Modern” courses every year since 2002; it was named Top 20 Golfweek Magazine “Best Residential Golf Course Communities” since 2002; “Top 20 Best Courses in State” by the Golf Digest panel since 2003 and was #13 on that list in 2007 and 2008; selected as the third favorite “Private Club Course in Arizona” by local PGA Professionals in Desert Golf Magazine from 2006 to 2008; and lastly was declared in 2007 as one of “America’s Top 50 Modern Golf Clubs” by Golf Digest Index. Take my advice and check out their membership options which now include varieties such as “The Player’s Club,” “The Annual Membership,” and “The Snowbird’s Club.” Or better yet, become a Member for a Day and see what the whole world knows to be as modern, decadent golf. 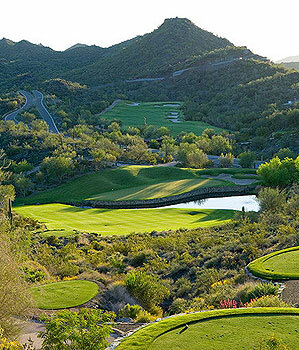 Also dont forget to read all Arizona Golf Course Reviews of all golf courses in Phoenix, Scottsdale and Tucson. I think this is the best course I have ever played. Breathtaking views of the desert and all the golf challenge I could ask for. I played the course from 6800 yards and found it to be hard but fair. Hitting four and five irons into par fours was pretty common and a lot of fun. Getting to the greens was only half the battle, being able to judge the speed and subtle breaks was a whole different animal. Hard but fair is how the starter described the course and I think that is very accurate. If you are looking for a great golf challenge and spectacular views, you have found the right place.